A good concealer can hide a multitude of sins. From unflattering dark circles to unpredictable breakouts, there’s a reason I spend time choosing the perfect concealer – it really matters! And, after searching (and searching some more) I think I have found it. I’ve been a little concealer greedy here, choosing a concealer range to tempt you with rather than just one, but it’s justified trust me. Let me introduce you to Benefit Boi-ing, a one-stop shop for all your concealer needs. 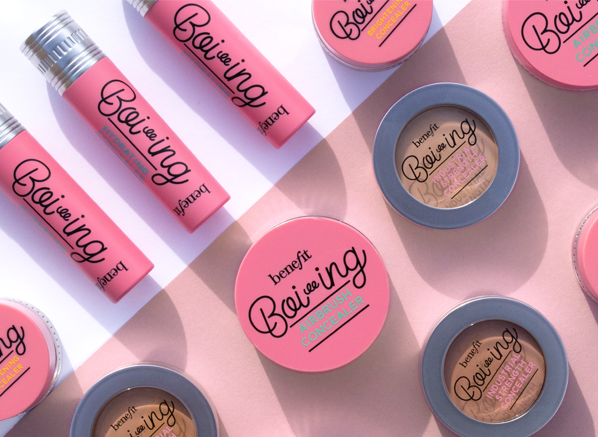 With a variety of formulas, finishes, and coverages on offer, Benefit Boi-ing really is concealer heaven. Let’s start with the Boi-ing that started it all! A cult favourite through and through, the Boi-ing Industrial Strength Concealer is a stay-put, full coverage creamy concealer with a matte finish. Designed to cover almost anything, this coveted formula will help reduce the appearance of dark circles, blemishes and even discolouration. The one to choose if you’re looking for a concealer that means business, this blendable formula will give your complexion a flawless look in a few quick pats. Tip: Use the Boi-ing Industrial Strength Concealer with a small concealer brush to cover stubborn imperfections. Next up is the newest member of the Boi-ing family, the Boi-ing Airbrush Concealer. Made with the under eyes in mind, the Airbrush concealer has the ability to blur, smooth and conceal with its soft-focus finish. Lightweight and non-cakey, the waterproof (yes, waterproof) formula lasts for up to 10 hours and doesn’t crease or settle into fine lines, making it an ideal choice for mature women. Thanks to its sheer-to-medium coverage, the Airbrush concealer is a great all-rounder, allowing you to keep it natural day-to-day and increase coverage as and when you need it. Tip: Warm the Benefit Boi-ing Airbrush Concealer in between the thumb and index finger for seamless application. Trouble with dark circles and discolouration? The Boi-ing Brightening Concealer is the one for you. Formerly known as Erase Paste, this popular concealer has been repackaged and renamed and it’s never looked so cute! Designed to give an instant wide-eyed result, the creamy texture contains brightening melon undertones to illuminate and colour-correct. The blendable, cream formula offers a full coverage that promises to make tired eyes a thing of the past. Tip: Use the Benefit Boi-ing Brightening Concealer on the inner corner of the eyes for extra brightening! Every concealer range needs one that is packed with hydration and the Boi-ing Hydrating Concealer is that and more! Formerly known as Fake Up, the concealer is infused with vitamin E and apple seed extract, which keeps the skin hydrated for up to 6 hours. A must-have for someone that prefers a natural finish or has dry skin, this lightweight concealer will visibly reduce the appearance of dark circles, without ever going cakey or feeling heavy under the eyes. Tip: Apply the Benefit Hydrating Concealer over any concealer throughout the day for an instant pick-me-up. This entry was posted on Monday, September 25th, 2017 at 10:07 am and is filed under Brand Focus, Make-up, New products, Spotlight On, Swatches. You can follow any responses to this entry through the RSS 2.0 feed. You can skip to the end and leave a response. Pinging is currently not allowed.